Casey Donahew (born April 21, 1977 in Burleson, Texas) is an American Texas country music singer in the band Casey Donahew Band. Starting off playing local bars in 2002 they soon became a favorite on the Texas bar circuit eventually working their way to national level in 2009 when one of the band's self-released albums hit the country Top 30 album chart in Billboard magazine. The band's high energy level, throughout extra long live sets, started to attract Texas' pre-teen bar crowd, when Pam Minick, from Texas' famed club Billy Bob's took notice, and she hired the Casey Donahew Band for a headlining spot and the college-age crowd came with. When the band released the album Lost Days in 2005, selling as many on the Internet as they did at shows. 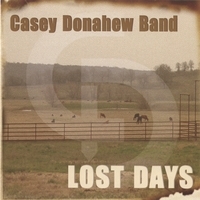 With guitarist Brent Wall, bass player Steve Stone, and drummer Taz, the band released their 2006 album simply titled "The Casey Donahew Band" and then in 2008 releasing the rowdy live album, "Live-Raw-Real, in the Ville". With many of the sales coming from digital download services, they broke the Billboard charts with their album "Moving On". Despite the band's growing national reputation, The Casey Donahew Band still keeps true to the Texas Country standards. Keeping their marketing on a low key level, with a website, YouTube page, Facebook page and continuing to play the local Texas bar scene."